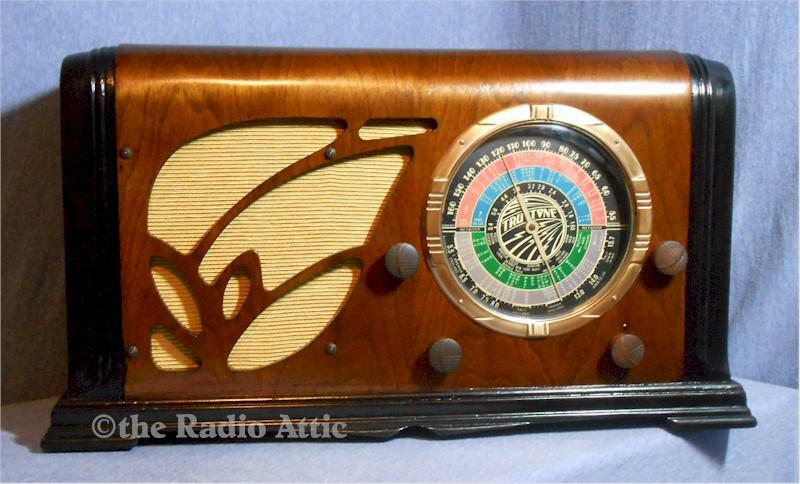 This rare and very impressive radio is seldom seen or offered for sale. Manufactured by Detrola for the Western Auto "Truetone" brand. With seven tubes, it receives the Broadcast band (550 to 1650 KC) and Short Wave in two bands from 1.65 to 16 MC. Features an 8" Rola speaker for great sound, and a brightly illuminated multicolor dial for night use. Was nicknamed "The Tulip" by collectors because of the speaker cutout. It has had a complete electronics tuneup with all new capacitors, tubes and resistors checked and replaced as needed. It performs very well on all bands using a 10-ft wire antenna. The cabinet was professionally restored using the same type nitrocellulose lacquer as originally used. There are no veneer patches, and the waterfall front is absolutely stunning. Knobs, dial, escutcheon (with glass dial cover) are all original. It displays beautifully and will be a highlight of any collection. Aux input cable has been added; play your favorite tunes or old time radio shows from CD player, iPod, etc. A Bluetooth receiver can be added and you can stream tunes from your phone, laptop, etc. 90 day warranty. 20"W x 11"H x 9"D.